Bogballe is known for setting new standards in spreading technology and accuracy. 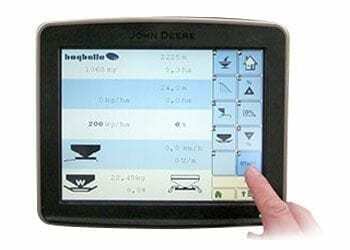 For example in 1991, Bogballe engineers developed the first spreader in the world that could be connected to GPS. Today this technology has never been more relevant as many farmers demand fully automatic systems for headland control and variable rate application to improve accuracy, increase output and reduce waste. 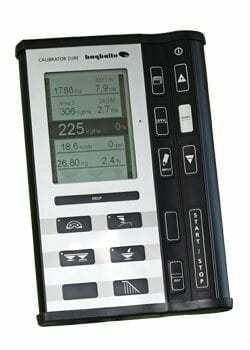 Calibrator Icon is the intelligent solution for controlling M3, M2, L2 and L1 spreaders without the weighing system. Operation is easy to understand icons. CALIBRATOR ICON contains all necessary functions required for a professional spreading result. Field data for different fields can be downloaded to a PC and imported to an excel spreadsheet. The average rate (kg/ ha) total spread area (ha) and total kg applied for each field is recorded. The spreading work is completed in an efficient and flexible way with CALIBRATOR ZURF. Fitted with weighing technique and CALIBRATOR ZURF the spreader is 100% speed related and fully automatic. This ensures high precision and quality in the spread pattern, as the quantity will be accurate no matter forward speed and field conditions. A user-friendly logical layout and function is supported by a help function and operating instructions in the display. Before spreading work begins, planned fieldwork can be uploaded via USB connection. After having finished the work, recorded data can then be downloaded and used for a complete documentation of fieldwork. All spreaders with weighing technique are available with ISOBUS. This professional solution, which makes it possible to operate the spreader via the tractors ISOBUS terminal. The ISOBUS controller fulfils the ISO 11783 norm and controls all functionality of the spreaders electrical components. The ISOBUS controller is equipped with a breakaway plug for easy connection with the tractors ISOBUS network. With the ISOBUS solution, we offer high precision and quantity in spread pattern no matter forward speed or field conditions. The ISOBUS solution can be controlled automatically by GPS depending on the tractor terminal and software. iZURF is a smart app for GPS controlled headland and section control management, which is downloaded to your Android tablet via Playstore. The system is literally a “plug and play” solution, which consists of a GPS antenna with receiver and a wireless iZURF communication module, which is connected to the spreader controller CALIBRATOR ZURF. 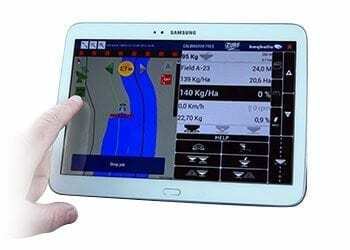 All you have to supply is a ANDROID tablet and you are ready to go!